What is art? Form becoming style; but the style is the man; therefore art is the humanizing of forms. This is a quote from Jean-Luc Godard’s 1967 New Wave classic, 2 or 3 Things I Know About Her, a fascinating critique and discussion about forms and language. I think it’s important to make a few notes about the French New Wave that might aid in a better understanding of what I’m writing. In the 1950’s a group of French film enthusiasts and intellectuals gathered in Paris and started a revolution of cinema that spun the medium on it’s head and effectively started a unique, counterculture style in the world of film. The main parts of the group consisted of filmmakers Jean-Luc Godard, Francois Truffaut, Eric Rohmer, Claude Chabrol and Jacques Rivette as well as critic and theorist Andre Bazin. The main goal of the films they made was to restore and push film to the status of intellectual property; to an art, by way of subversion. Much like the quote above, the films of Godard and the others aimed to give humanity (style) to a decidedly dehumanized form: the form is the camera, actors, and dialogue, and the style is the way in which a filmmaker uniquely uses these elements. The French New Wave purported the notion of the “Auteur Theory”, which consists of the belief that the filmmaker’s (or author’s) vision and personal stamp are most important to the meaning of the film. The classical way of making films was lacking in personal style, because it was stuck in a formal rut rooted in structure and set parameters. That’s where these filmmakers came in. They want you to know who is making the film, they want you to know that you are watching a film, and they want you to know there’s both actor and character performing on the screen. The French New Wave openly invited viewers to participate and be active spectators. 2 or 3 Things I Know About Her is a perfect example of what the French New Wave was going for, so let’s dig in. First, the whispering narrator of the film is none other than Godard, himself. So, right off the bat he is making himself not only the author of the film in a cinematic sense, but he is also the author in the narrative sense. Concurrently, the film opens with an introduction to the lead character, Juliette, whom we meet with a straight-on camera laced with Godard’s voice-over. 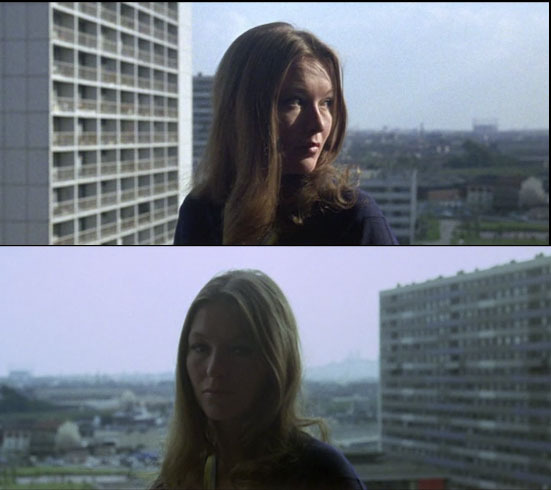 Next he cuts to the same woman on the other side of the balcony, same camera angle and narration, except now we are introduced to her using her real name, Marina Vlady; character and actress as one, but separate beings. Thus, we are shown the duality of the film right away, that being that this film will blend reality with fiction in a very upfront manner, a technique that strips away the veneer of cinematic illusion and leaves us fully aware of the film’s presence and that we, the audience, exist within that presence. Actor and character presented as one, but separate. After this opening we are shown several scenes of noisy road construction being undertaken, jarringly followed by cuts to peaceful places in Paris, such as a calm river and quiet trees. These dialectical cuts serve a similar purpose as the opening, which is to make the viewer aware that they are watching a film. Cutting from the noisy construction to the quiet nature scenes makes the cuts more apparent to the viewer instead of seamlessly moving from one scene to another as in classical editing. In most films the viewer is not cognizant of the editing techniques being used in the film, which is the goal of any good editor. These filmmakers purposely wanted people to notice the edits and to be aware so that they can acknowledge the relationship between the images. So straight away the viewer is uncomfortable and unable to be immersed in the narrative, mainly because Godard restrains the narrative until after he’s set-up the viewer’s perception. The structure of the film, itself, is like an open discussion and a back-and-forth between interview and classical narrative; the reality and fiction I mentioned earlier. The characters are often shown going about their mundane business, and at the same time they are answering questions being silently lobbed by someone off-camera, which is likely to be Godard. The questions are never heard but the answers reveal an existential nature to the discussion, as French New Wave films are wont to do. Specifically, the discussion of language, meaning and forms is brought up frequently, and I would dare to say it is the theme of the film, visually and narratively. The conversations concerning language are often about meaning. The question is asked, how do we know a green sweater is green? How do we know it’s not really blue? We know it’s green because long ago we were told what green is. But what is the meaning of “green”? Only that we assigned a meaning to the word green, and assigned that to the specific color we call green. Towards the end of the film a character asks another what they did all day, to which the other character responds, “I worked at the garage”. The first character asks, “How do you know it’s a garage?” and proceeds to ask why it isn’t a pool, for instance. Because, again, we took the form of a garage and assigned a meaning to it, and then assigned a word. This is called semiotics, which is fully defined as “a general philosophical theory of signs and symbols that deals especially with their function in both artificially constructed and natural languages and comprises syntactics, semantics, and pragmatics“. Godard, here, is challenging the notions of language and the acceptance of it’s limited form. Where is the beginning? But what beginning? God created heaven and earth. But one should be able to put it better. To say that the limits of language, of my language, are those of the world, of my world, and that in speaking, I limit the world, I end it. And when mysterious, logical death abolishes those limits, there will be no question, no answer, just vagueness. The existential crisis is dripping from this statement. Language has limits, and yet that is the only way we can describe the world, therefore the world has limits. Humanity is limited by the nature of language. I’m going to end this mini discussion of this film on that note. If you have an interest in intellectual films and are open to what they are capable of then I highly recommend this one. There are several more discussions to be extracted from the text of this film and I can’t wait to buy the Criterion disc and check them out.